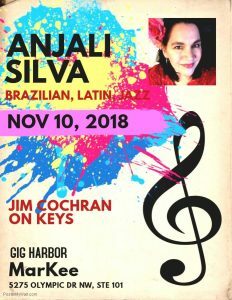 Join Anjali Silva and Jim Cochran for a rhythmic and delightful evening of Brazilian, Latin and Jazz music while you nosh and sip on the tasty fare of MarKee Coffee House in Gig Harbor! Anjali Silva, a San Francisco Bay Area native of Portuguese, Mexican and Sephardic lineage, is known for her warmly, sensuous voice and engaging performances. Her musical expression is a unique blend of Brazilian, Latin American, and American jazz styles. She has spent a lifetime performing nationally and internationally, teaching music, and composing spiritual and socially conscious songs. Most recently, Anjali performed a concert of original music at the Washington Center for the Performing Arts Black Box Jazz Series in Olympia.